Happy Friday! 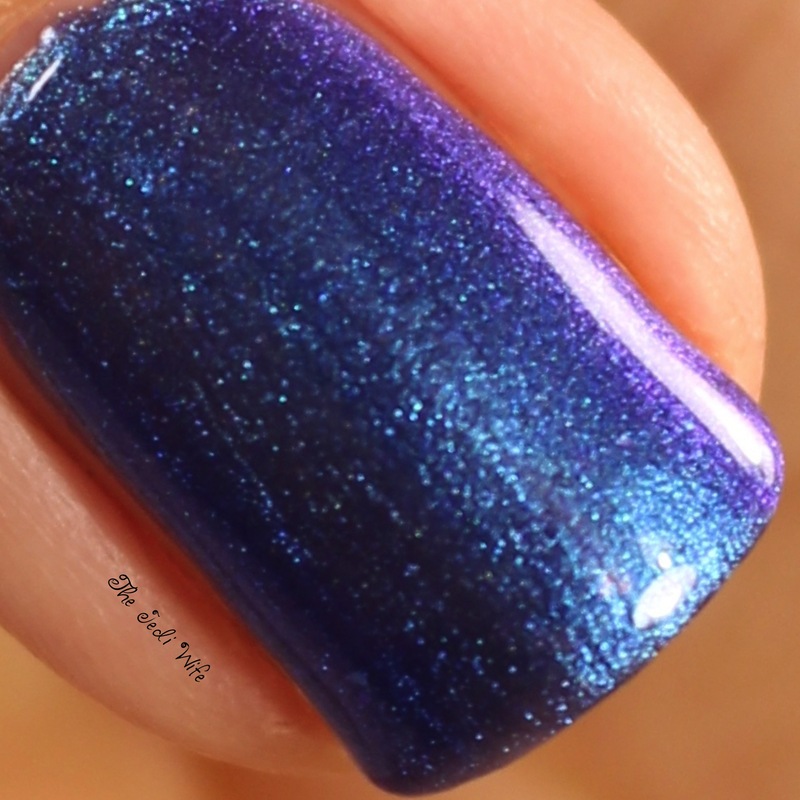 For today's blog post, I wanted to share some swatches of a few of the Indie Shop exclusives I bought. Rather than one large post, I'm breaking this up because I'm actually wearing these for a full day on my nails so I can enjoy them. Let's check out the first set! The base colour is gorgeous, but the best part of this beauty are the subtle rainbow flakes! They are subtle so as to not overload the base, but the extra flashes of colour when the light hits them just so is gorgeous! Oh man, this one was not easy to photograph, and I was able to capture the colour shift in my closeup. La Quinta is deliciously complex, and I felt like I was looking at something new every time I looked at my hands. This is my first Squishy Face Polish, and I love it! The assortment of flakes against the blue base are perfection! I needed a little bit of a palette cleanser so I opted to wear Beverly Hills. The peachy pink base is a pretty shade, and I adore the subtle flashes of sparkle. I had such a difficult time capturing the shift on camera, but you can see a little of the purple along the side of my nail in the closeup. 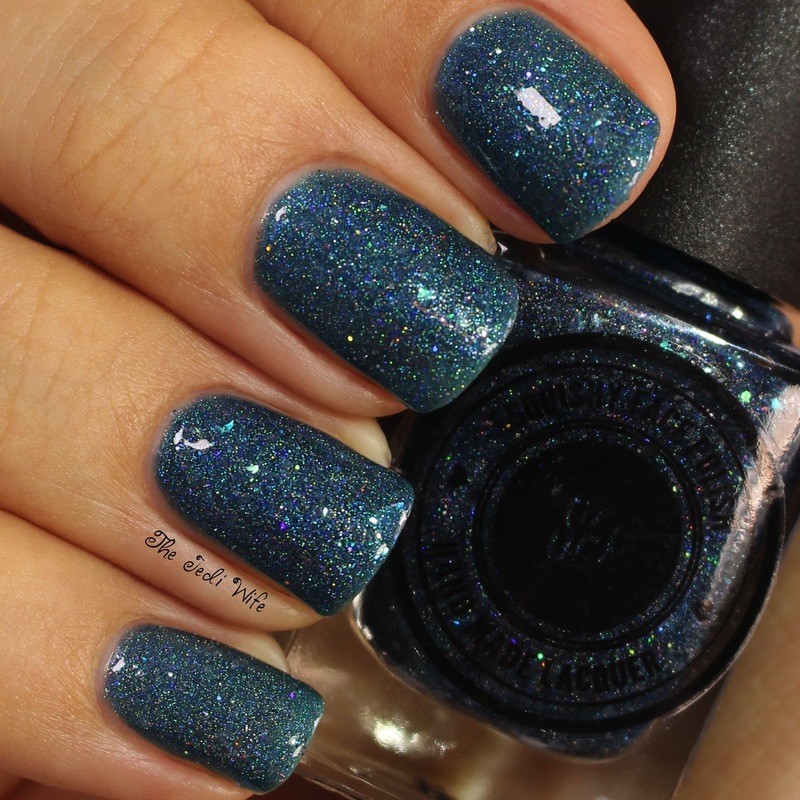 This is another lovely shade from the Indie Shop event! 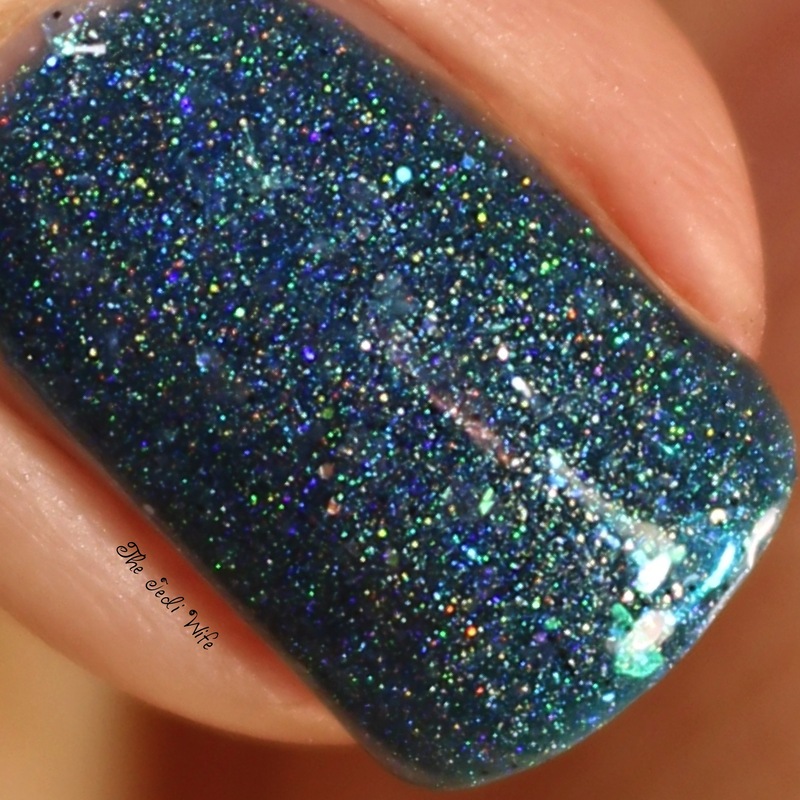 Last up for today's blog post is SCLA by Lavish Polish. I am a sucker for black-based polishes, especially when they have hints of colour in them. I'm swooning over this beauty and having this an an option for when I want dark nails. Because I'm actually attempting to enjoy wearing the polishes from the Indie Shop, I'm not going to have Part 2 of the exclusives up right away. I hope you've enjoyed this first set I'm sharing this morning! Which are your favorites? I'd love to hear from you! These are great colors. I love the California theme they went with for these exclusives. My favorites of this bunch are Anaheim, Beverly Hills, and SCLA. ooh so pretty! I love your swatches and really enjoy Beverly Hills and SCLA. They are all gorgeous colours! I love all of these! I was lucky to get the Ever After one from the overpour! The Ever After and La Quinta are some of my favorites. I haven't gotten a chance to try out all the exclusives yet, but there were to gorgeous polishes. Ugh they're all so gorgeous!! SCLA and Beverley Hills are the standouts here for me :D Great swatches! Dude! That PCNP is made for you! Stunning! My bottle of La Quinta should be arriving from my mule today. I'm so excited! I am loving all your swatches of these! the peach and the black. Holy cow. 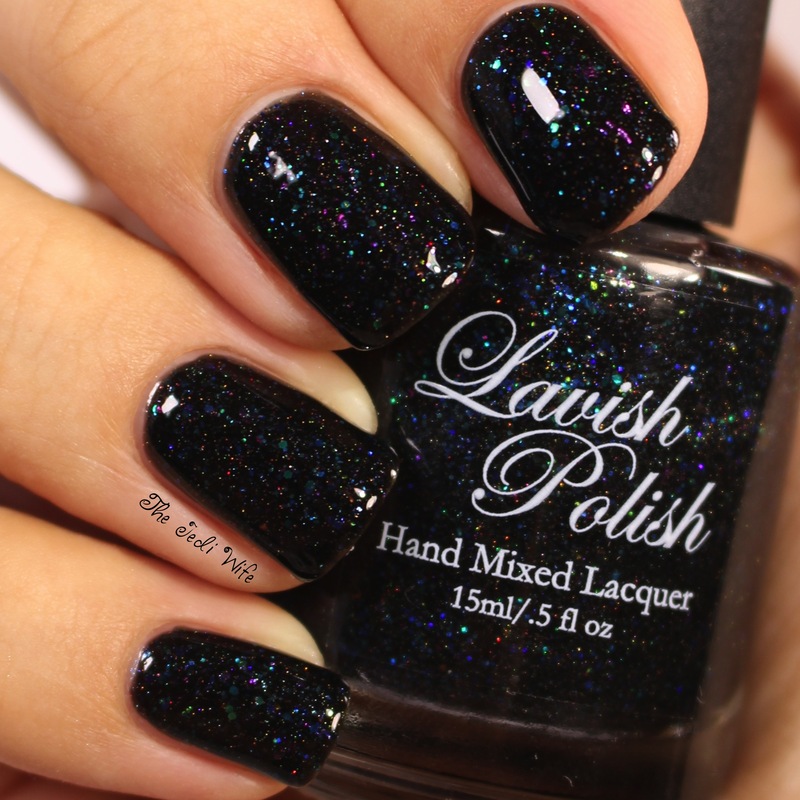 These all look great on you, I love that black by Lavish Polish. I also like hints of color in black polishes. Gorgeous! The Polish M La Quinta is my fav! Super pretty, I love the depth in the Lavish Polish!